Brief Description: Iceman and Beast’s double date is interrupted when a sub-human menace named Grotesk stops their train with his bare hands. Who is Grotesk and why does he hate humanity so much? *Grotesk (Prince Gor-Tok): Grotesk used to be a prince of a civilized subterranean raced called the Gortokian Subterraneans. His race had human intelligence and looked like humans. After humans killed his people with underground atomic explosions, his race became extinct with the exception of Grotesk. He then vows to destroy the human race. -Powers: Grotesk has superhuman strength. This issue begins with a mysterious monster-like man attacking a train that Iceman and Beast are on with their dates. 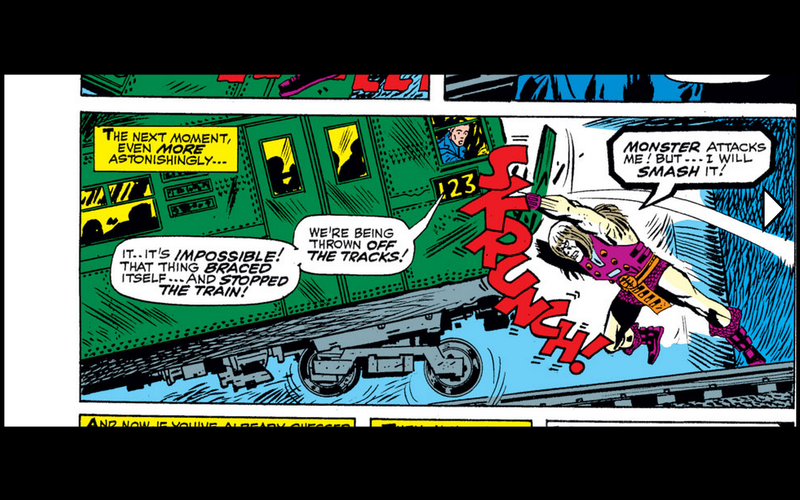 The two X-Men exit the train and attack the strange being, calling him grotesque. The monster likes this name and decides that he will be called Grotesk. Grotesk defeats the two mutants and escapes. 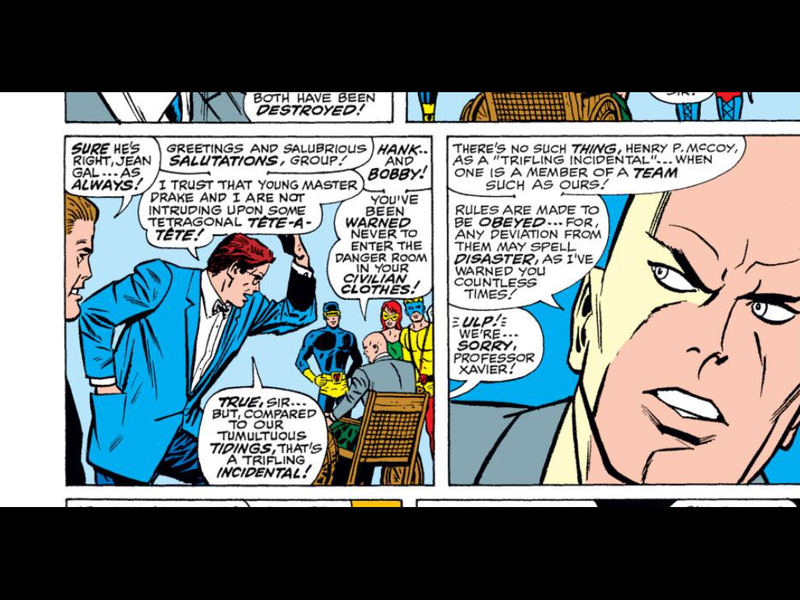 Bobby and Hank then report their story to Professor X and the whole X-Men team now seeks out Grotesk. Grotesk is found at the company that created the device that killed his people and the X-Men brace themselves for battle. The issue then switches gears to the origin story of Cyclops again. After Professor X confronts living diamond, the villain crushes the professor by leveling the building on top of him and then Living Diamond and Cyclops run away. Living Diamond then takes Cyclops to the building that gave the villain his powers and has Cyclops stand guard while Living Diamond uses the radiation machine to coat his entire body in diamond. 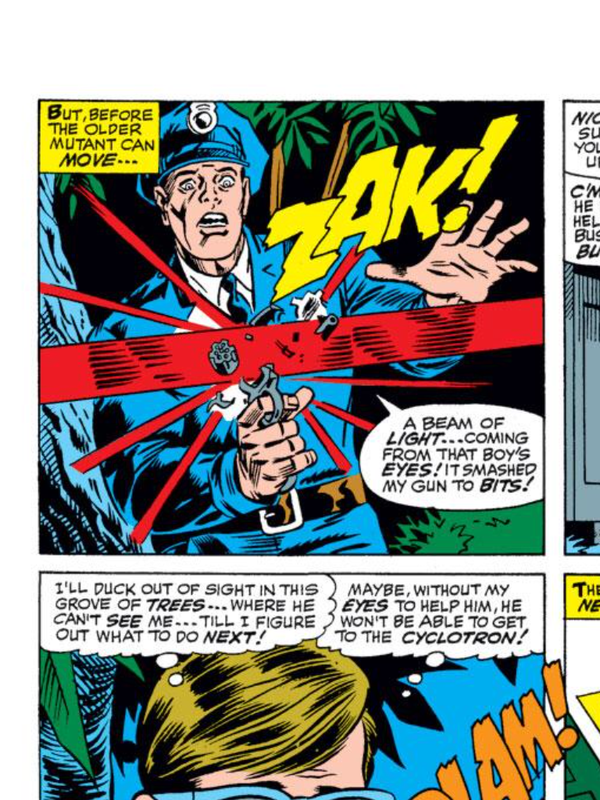 Cyclops uses his powers to defeat policeman that arrive on the scene because he fears the Living Diamond will kill them if they attack the villain. While fighting policeman, Professor X arrives and tells Cyclops that he needs his help to defeat Living Diamond. 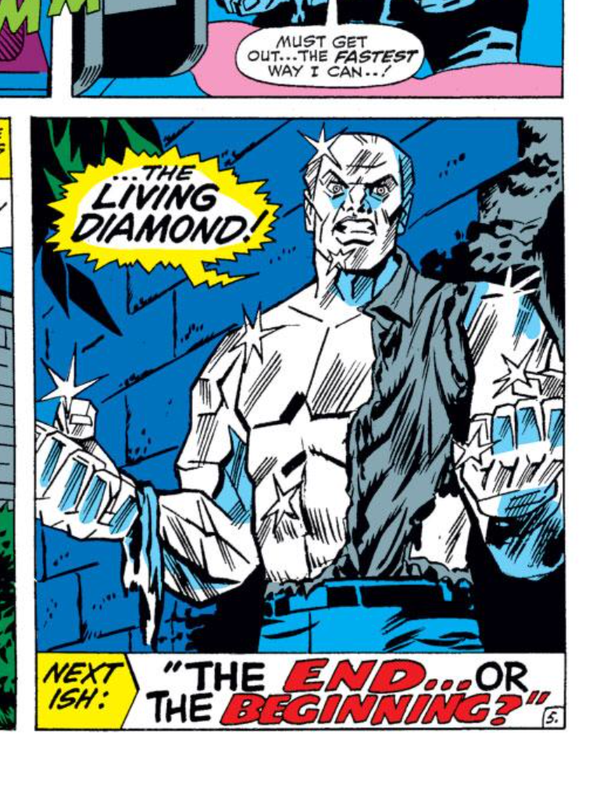 The issue ends with Living Diamond emerging from the building with a body that is completely made of indestructible diamond. 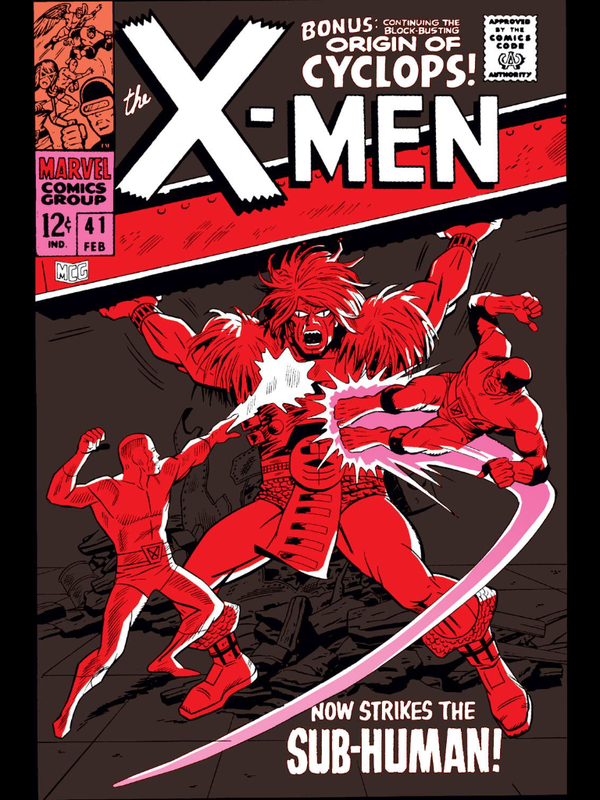 Issue 41 is another terrible issue of Uncanny X-Men. The only reason I did not give this issue 1 star out of 5 is that it is ever so slightly better than the other 1 star issues. Cyclops’ origin story has some likeable moments that make this issue a bit more tolerable. I am also ever so slightly intrigued by Grotesk because I know that he is the one that will kill Professor X in the next issue. 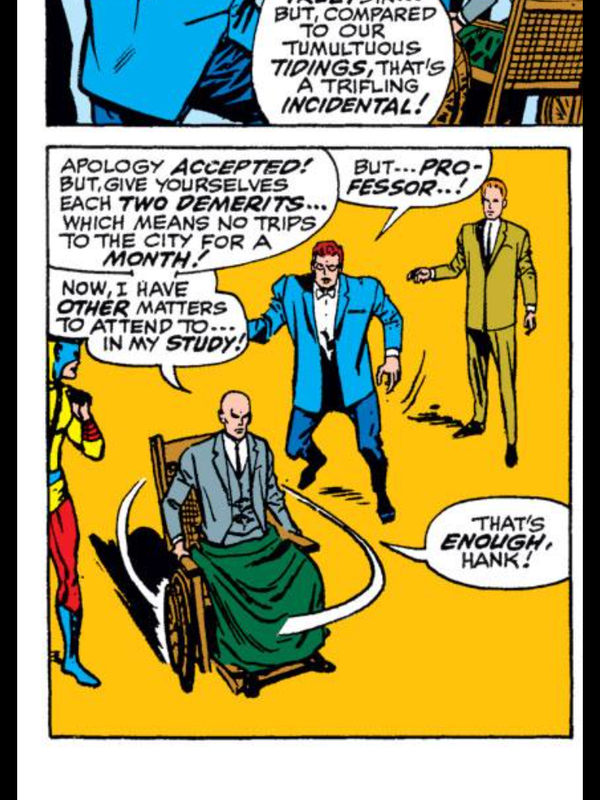 (Spoilers) That next issue is a big moment for the comics, although it is later revealed that it is really Changeling impersonating Professor X who is killed. Professor X was very moody and angry in this issue, and that is clearly because it was Changeling who was impersonating him. The intrigue with the coming death of Changeling as Professor X also gives this issue a tiny boost above 1 star. This issue, like other issues before it, is extremely boring because nothing really happens. The issue ends before the X-Men’s big battle with Grotesk so the whole issue is devoted to random training sessions with Professor X and panels of the X-Men looking for Grotesk. 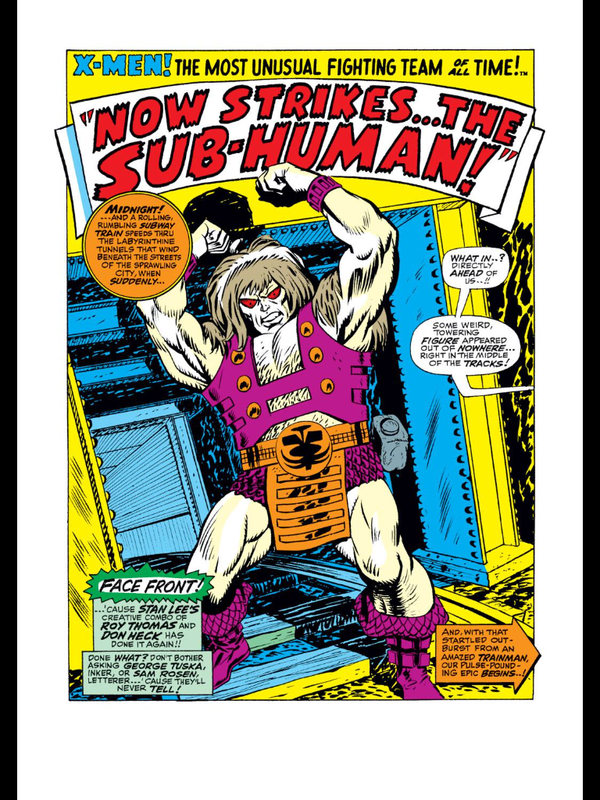 Grotesk is also a very ordinary villain and I definitely understand why he rarely returns to Marvel comics after this story line. This issue was another subpar issue, but I hope that the “Death of Professor X” issue that comes next will be much better. 1. I enjoyed this panel of Cyclops taking out a cop’s gun. Here, the Beast’s usage of words is ridiculous! Why does he use the word “tetragonal”? It’s almost never used; I’m not sure it has ever been used! Why not “rectangular”; unless the idea is to show that he is pedantic and too full of his own intellect? I never really took to the first incarnation of the Beast. He is equally intellectual now, being blue furred, but somehow it’s more acceptable now, to me at least. Yeah Beast is currently my least favorite member of the team. He’s way too snobbish so far. I think the idea was to have a brutish beastly member who is, by way of contrast, highly intellectual, a kind of anti-Hulk. Most of the time, the physics genius Bruce Banner is completely submerged into the barely articulate Hulk. There are rare times when all the intellect of Banner is available in Hulk form; these never last long, and as we all know, it is not the classic Hulk; none of the movies has a smart Hulk. Anyway, this Beast doesn’t really work, which is why they eventually change him. A somewhat intermediate case is The Thing. He’s no dummy, a qualified pilot, but he’s no scientist and speaks a kind of lower-class, blue collar English from the streets of New York. I`m really loving these! Keep it up. I’m glad you like them! I still got over 500 issues to go so I won’t be stopping any time soon!